I’ve spent the better part of the past few months obsessing over my new grill. After going a year without one, sad faceing at the grill recipes I saw on other blogs, I finally caved and bought one. 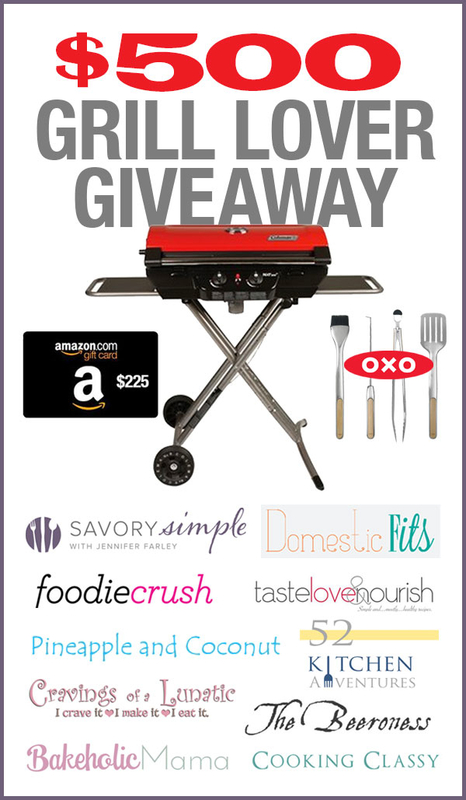 As a way to feel a little less guilty about taunting the grill-less, I’ve teamed up with a bunch of other fantastic bloggers to offer one lucky reader a fantastic grill package worth over $500. Although we are on the waining end of summer grill season, we are rapidly approaching tailgating season. The Coleman NXT 200 is powerful portable grill that’s perfect for fall football adventures and the gift card is a perfect way to add some accessorites to your grilling good times. I have this Cameron Stove Top Smoker, it’s perfect to use indoors as well as on the grill. A good grill brush is important for when you want to cook more delicate food, or grill a pizza. And don’t forget a grill basket for those vegetables. 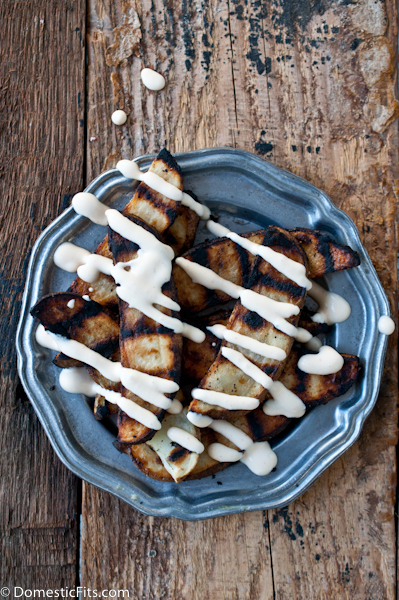 In the spirit of grilling and tailgate food, I’ve whipped up some grilled Tailgate Fries with Sriracha Buttermilk Cream Sauce. 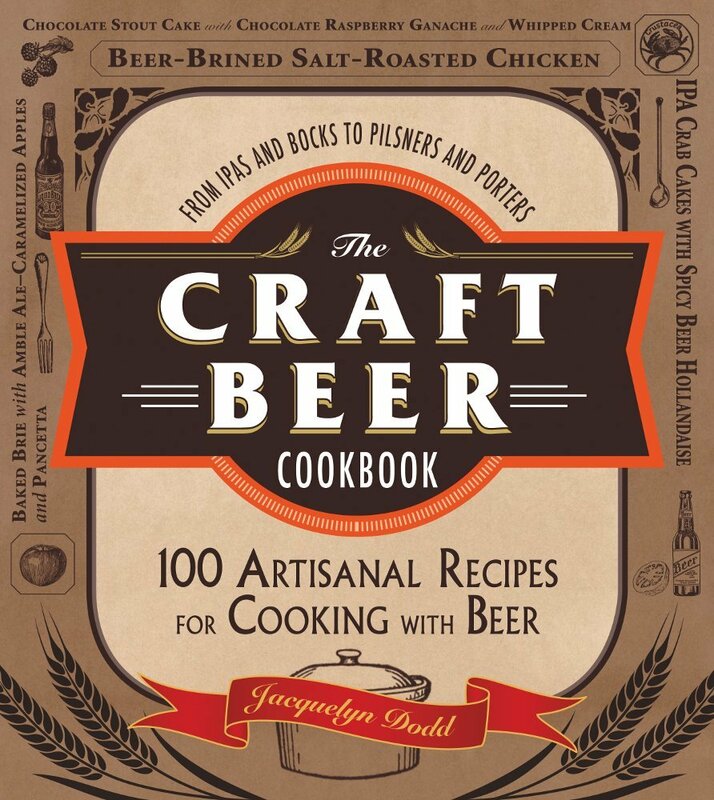 Enjoy, and don’t forget to visit the other great bloggers hosting this giveaway! In a large bowl stir together the water and 3 tbs salt until the salt has dissolved. Cut the potatoes into ½ inch wedges. Soak the potatoes in the salt water for 30 minutes at room temperature. Remove from water and dry well. Add potatoes to a large baking dish or rimmed baking sheet. Drizzle with olive oil and spices, toss to coat. Add the potatoes to the grill, close the lid and allow to cook until strong grill makrs appear, about 5 minutes. Turn and continue to cook until tender when pierced with a fork. To make the sauce whisk together all sauce ingredients until well combined. Add to a squeeze bottle, drizzle over fries. These fries look amazing but the sriracha sauce is calling my name! We love grilling pork ribs! Grilling is the best way to go in the heat!! These fries look amazing and I LOVE those grill marks on them!! Plus, that sauce? Wow, that is calling my name! Such a fun giveaway too! Love to grill veggies! Those fries look so yummy and i love anything with sriracha! Nothing screams summer like grilled corn! Ohhh Jackie, these fries look incredible! And that sauce?! I’m in love! These photos are amazing! I’m in love with the grill marks. We just got rid of our grill when we moved last summer and I HATE not having one anymore. I love grilling pizza and sweet corn. Delicious sounding recipe. Must try! Lamb chops are my favorite. I absolutely love a really good Rib Eye Steak,seasoned with a good rub! My favorite part is getting to gnaw on the bone! 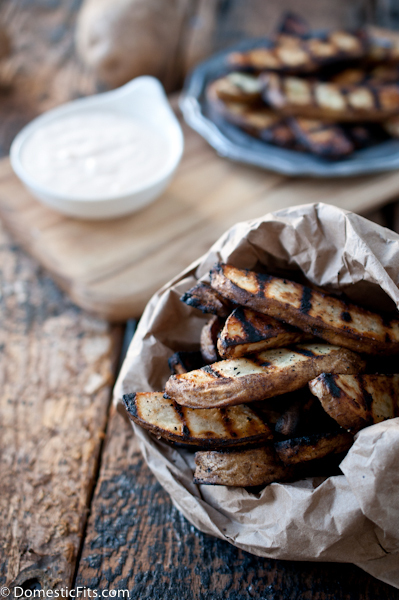 We grill all year ’round but I have never grilled fries…will be doing that ASAP! I want to grill everything and put that sauce on it!! I especially love grilled stone fruit. Peaches, plums, the best. I grill so much ran out of gas half way through last night got o love neighbors who also love to grill! WHAT?! Grilled Fries AND Sriracha Sauce?! I die. 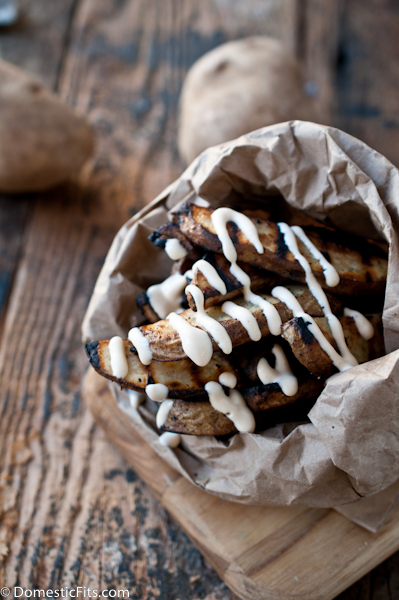 I have never tried grilling fries, but it looks and sounds like a fabulous idea! I love grilling kebabs! Looked delicious. I love how grilled those fries are! Favorite thing to grill: onions. And put them on everything. smoked pork for pulled pork sandwiches! Honestly? Pineapple. Or filet mignon. My favorite grilled food is peaches – or corn. I love California produce in the summertime! Filet mignon and provoleta ( very thick slice of provolone cheese with a hint of oregano). Holy moly. Best fries ever! And that drizzle?!!! Swoon! These fries look great, but my favorite grilled food would have to be medium-rare steak! I LOVE grilled hot dogs and hamburgers and chicken and corn. 🙂 Also would like to try some grilling recipes I’ve seen also. I haven’t heard that yet! I didn’t put the raffle copter together but I’ll try to figure out if I can see what happened. I love grilling in the summer and I am very excited to try grilled peaches with ice cream. How gorgeous are these? Look at those grill marks! I love Sriracha sauces too, on pretty much anything. We’re going to our first NFL game this year (49ers vs Redskins) and will be tailgaiting. So, I’m super excited to try these!